Today's post isn't about a race. Instead, today I officially reached my weight loss goal, and we celebrated with my Weight Watchers group this morning! 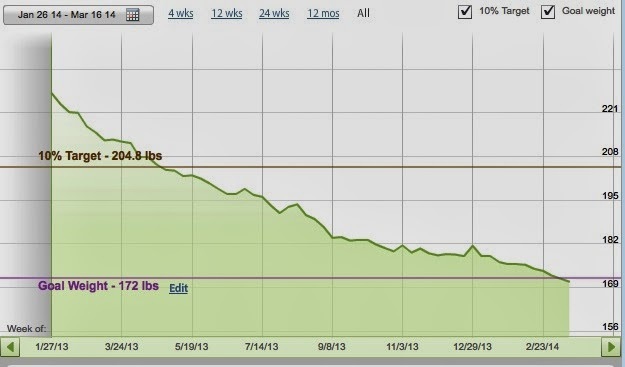 When I started on January 27, 2013, I weighed 226.8 lbs. It was a very happy day in mid-summer 2013 when I dropped below 200 pounds for the first time in more than a decade. This morning I weighed in at 170.8 lbs! Admittedly I was wearing the lightest clothes possible, but that still counts. My goal now is to stay in the range of 170 - 174 lbs for the next six weeks, and then I will qualify as a Lifetime member in the Weight Watchers program. 1) Tracking what I have been eating. Before joining Weight Watchers, there were many days in which I was eating twice as many calories as I needed. With the Weight Watchers tools, I've learned to eat in a way that gives myself time to feel satisfied. That may take several minutes after finishing a small meal, but in most cases giving myself those few minutes is enough. And if I get hungry between meals, I eat fruit as a natural and healthy snack, which I don't have to track. I haven't given up too many things, I just eat less of those favorite foods. For instance, with dessert, often it's the first bite, that first taste, that is the best. The remaining bites are just calories. 2) The Weight Watchers group. Each week I meet consistently with a group of fellow weight watchers, where I've learned many tips on losing weight, maintaining weight loss, and living a healthier and active lifestyle. Having a consistent group of people on the same journey, several of whom are becoming friends, has been extremely helpful to staying on track. 3) Bonnie. My lovely wife is taking this journey with me. We're accountable to each other, and talk each other out of less-than-ideal choices. We're both enjoying significant improvements in our health, our appearance, and our attitude. 4) Running, especially running with good form. I detest the cycling machine, the treadmill, the elliptical cross-trainer. When I belonged to L.A. Fitness, exercising was an ordeal to get through. In the beginning, running was the same. But after I took a class in Good Form Running at the Big Peach Running Company, my attitude about running completely changed. Now I think of skills to work on with each run, whether it is maintaining a steady pace, a consistent speed for each kilometer, or a distance goal, as well as maintaining good form. I've also avoided serious injury, and my cardiovascular fitness has substantially improved. With Weight Watchers, it's a lifestyle, not a diet. I'm confident that it's a lifestyle that I can maintain. But it's up to me. Wish me luck! Goal: To get my weight down to a healthier level: Achieved! Goal: BMI range for my height = 139 - 174 lbs: Achieved! Addendum, May 4, 2014: Today I officially reached Lifetime status with WeightWatchers, having checked in for six consecutive weeks within 2.0 lbs of the goal weight of 172 lbs.